When I booked my trip to Nepal to hike to Everest Base Camp I naively thought that when hiking to the highest mountain in the world, I would have first class views of Mt Everest for the entire trip. Oh boy, how I was wrong. It turns out Mt Everest is one sneaky mountain and she likes you to work hard to find her. On this trip I was joined by 14 other people from around the world and we all had the same ambition to witness the Mother Goddess, Mt Everest firsthand. My fellow travel adventurer Lisa Owens shares her tips about what you need to know about trekking in Nepal here. Get a free quote online for adventure travel insurance. The first couple of days saw us enjoy quite easy hiking with lovely views. We saw tips of the snowy-peaked mountains but it was mainly dense forest and rickety suspension bridges. By day four we still hadn't seen a glimpse of her and anticipation was building amongst the group. 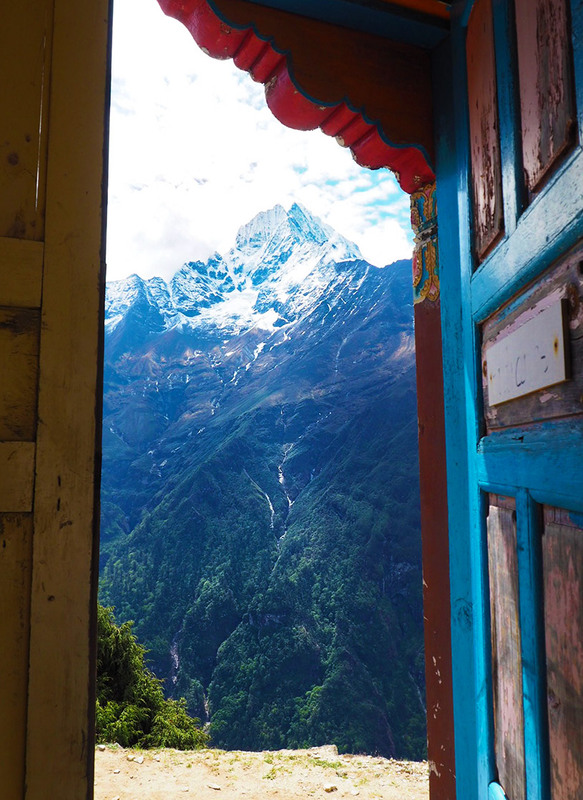 We hiked from Namche Bazar – the largest village on the trek – to a viewpoint at the ‘Everest View’ tea house. Certain that this aptly named teahouse would provide the goods, we rushed around the back to the viewpoint. Walking through a blue door that lead to the viewpoint was like discovering Narnia. As it opened, the most stunning mountain range stood before me. I walked through and a few metres on to the edge where Mt Everest’s neighbours, Lhotse and Nuptse, were in full view but Everest herself sat shyly behind the clouds. The days went on and we were getting deeper and deeper into the Khumbu region. We continued with not much success to search for the mountain that kept eluding us. Discussion over dinner revolved around which one Everest actually was and who had the clearest picture. We were becoming obsessed with finding Everest. We’d come so far, we had to witness her properly once! 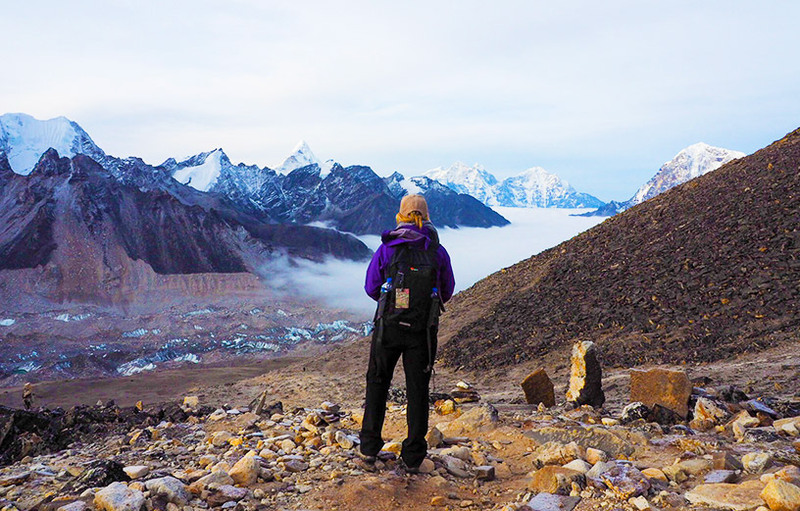 We hiked to Dingboche at 4,410m and was welcomed with the most fantastic view. Lhotse, Nuptse, Ama Dablam and the whole crew was in clear view and the snowy peaks shone against the blue sky. Except the Mother Goddess, Mt Everest, whose pyramid shaped peak was determined to stay hidden until the very end. Base Camp day arrived and we were sure today was the day! 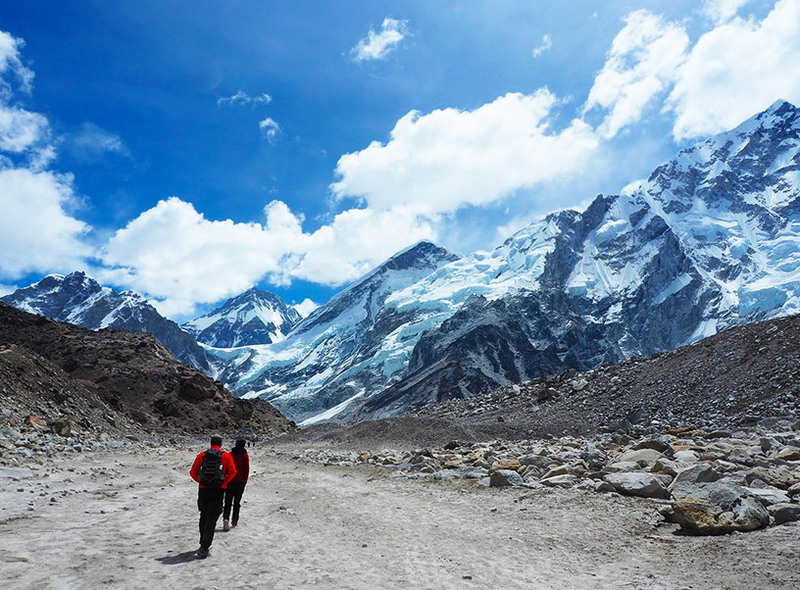 We had hiked to Gorak Shep – the final village before Base Camp - that morning and were on our way to Base Camp by midday. The sky was quite clear so our hopes were up but as we got closer to the whole reason we were hiking, the clouds descended in and created a white cover across the entire sky. Dismayed but happy to have finally made Base Camp, we knew there was one final opportunity to see Mt Everest and that was a sunrise hike to Kala Patthar the next morning. 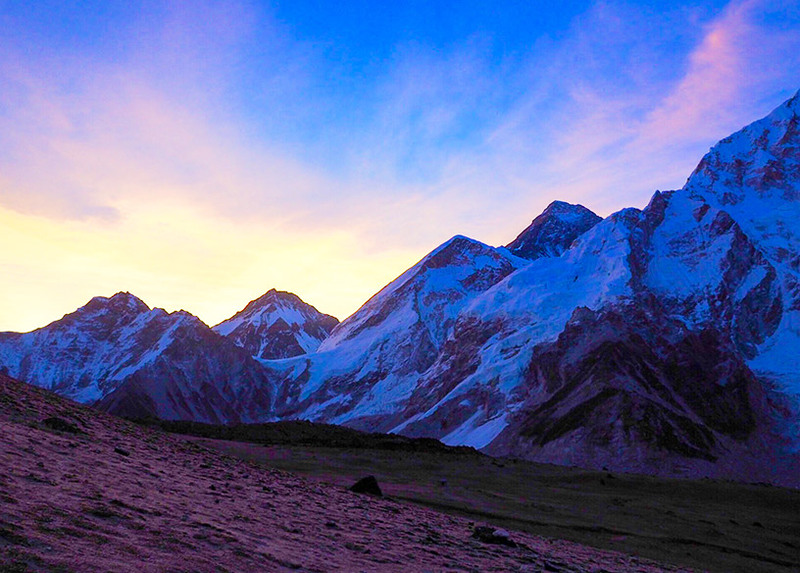 Important Tip: Altitude sickness can be problematic when hiking to Base Camp. It's important you are aware of the dangers of high altitude so have a read of Michael's tips here. By now most of the group had given up on the search. They were either struck down by altitude sickness or just plain tired and weren't ready to get out of bed at 4am to hike even further. Altitude sickness can be tough! Read how Linda had to be evacuated off Mount Everest because the alitutde became too much. However, I couldn't miss my final opportunity to witness the mighty Everest. The hike to Kala Patthar was brutal. We were hiking to 5,545m above sea level and the thin air made walking very difficult. Every step made me gasp for air. By the time the sun began to rise above the mountains, I’d only made it halfway to Kala Patthar. As dawn washed away the night sky, we were presented with the most brilliant light show. I sat down defeated and ready to give up my search. Pinks, oranges and dark blues highlighted the sky and the mountain peaks were big, dark shadows waiting to be illuminated by the sun. The glorious sunrise turned my mood around but I was still dismayed to have not witnessed Mt Everest. One of our guides who had been hiking steadily behind me came and sat beside me. As we watched the sunrise in silence, he pointed at the dark, shadowy peak in between the two snow-covered peaks of Lhotse and Nuptse. This peak hadn't been visible before, it was always covered by thick cloud. I booked my trek through G Adventures. However, you can easily book Everest Base Camp once you’re in Kathmandu. It’s quite a lot cheaper that way! Don’t be scared to go in low season. I went late May (start of monsoon season) and had incredible weather with a quarter of the tourists. Everest Base Camp is challenging to get to but not impossible. A good level of fitness is essential but it is the altitude that affects most. Hike slow and steady and listen to your body. Stock up on snacks in Kathmandu! Food gets expensive on the trek so buy up before you go. Travel with travel insurance. Get a free quote online.